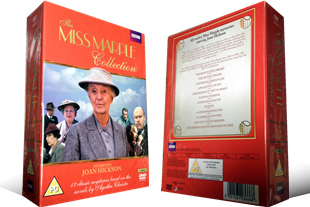 The Miss Marple DVD Complete Collection 12 DVD Box Set, DELIVERED FREE IN THE UK. Agatha Christies famous character Miss Marple played by everyones favourite Joan Hickson. This amazing boxset contains the following mysteries: Body In the Library, Moving Finger, A Murder Is Announced, A Pocketful Of Rye, The Murder At The Vicarage, Sleeping Murder, At Bertram's Hotel, Nemesis, 4.50 From Paddington, They Do It With Mirrors, A Carribean Mystery, The Mirror Cracked From Side To Side. A collection of the best from the BBC.